Vikings dressed to keep warm and so were normally made from: wool, linen and animal skins. Men wore tunics and trousers. Women wore long dresses. Cloaks and caps might have also been worn to keep out the winter cold. Clothes were fastened using pins and brooches, usually made from copper. These were often decorated with dragons and other beasts. They also liked wearing jewellery, such as beads and finger rings decorated with amber. Both men and women had their hair long and liked combing it using combs made of bone and antler. Hair could be tied back with a band and women often plaited it too. Viking cobblers made: slippers, shoes and boots out of calfskin or goatskin. 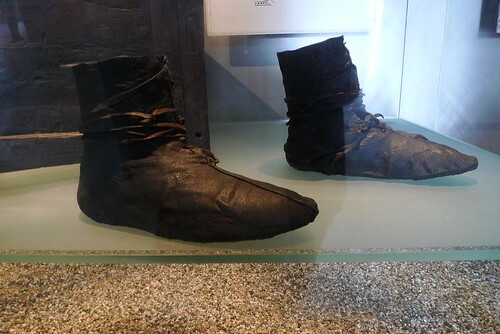 Footwear was often laced with a leather thong. New soles were sewn on when the old ones were completely worn through.